Summer means fun, and nothing says "fun" like that lovable purple dinosaur, Barney. 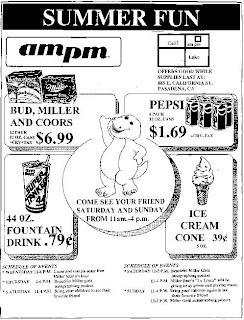 Here we can see Barney stocking up for good times: Pepsi, ice cream cones, a Super Tanker fountain drink, and cases upon cases of Budweiser, Miller, and Coors. Brought to you by your local PBS affiliate and your friends at AA.